Time's Up Bracelets and Ribbons to debut on Golden Globes Red carpet this year. Following the new transition culture at Awards shows, Time's Up supporters will make their red carpet appearances wearing bracelets and ribbons this year at the 2019 Golden Globes Awards. 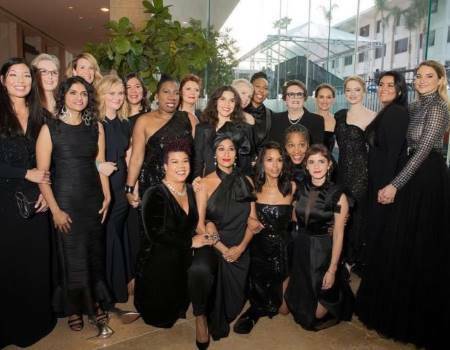 Last year, in solidarity of the #MeToo movement that stands against the sexual exploitation of employees in the workplace in the film industry, celebrities wore all black at the ceremony. Activists and actors like Marai Larasi, Ai-Jen Poo, Emma Stone, Monica Ramirez, Burke, Billie Jean King, were spotted at the red carpets along with other actors including Michelle Williams, Laura Dern, Emma Watson, Meryl Streep, and Shailene Woodley. Other than the workers facing sexual harassment in Hollywood, actress Emma Stone revealed last year, the movement also stands against the sexual violation issues faced by females in other careers. The black and white ribbons and band designed by Hollywood costume designer and stylist Arianne Phillips will symbolize that the actors are united and committed to creating a safe, fair and dignified workplaces for women of all kinds across all industries. Actress Reese Witherspoon suggested Arianne Phillips design the ribbon and bands. Besides, there will also be a visual representation of a new TIMESUPx2 campaign, which is a nod to the second year of the movement. The Time's Up movement against sexual violation founded on 1st January 2018, by various Hollywood celebrities in acknowledgment to the Harvey Weinstein scandal and in support of #MeToo movement includes nearly 4000 supporters. You can watch the 76th annual Golden Globes Awards hosted by Andy Samberg and Sandra Oh on 6th January, Sunday, at 5 p.m. PT/8 p.m. ET on NBC.